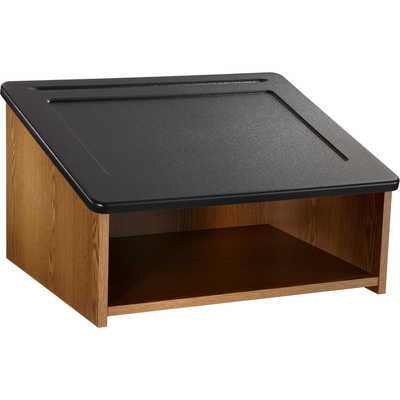 Use Lectern On A Tabletop Or With The Safco Lectern/Media Stand (Sold Separately). Speaker Platform Has A 19" Wide X 13" Deep Recessed Area To Hold Papers In Place And A Pencil Groove For Writing Utensils. With Lectern/Media Stand, Tabletop Lectern Creates A 45" High Mobile Lectern With Storage. When Used Alone, It Is A Mobile Media Stand For Tv/Vcr Or Projector. 3/4" Furniture-Grade Wood Has A Stain-Resistant And Scratch-Resistant Laminate Finish. Lectern Contains A High Percentage Of Recycled Material..
Use Lectern On A Tabletop Or With The Safco Lectern/Media Stand (Sold Separately). Speaker Platform Has A 19" Wide X 13" Deep Recessed Area To Hold Papers In Place And A Pencil Groove For Writing Utensils. With Lectern/Media Stand, Tabletop Lectern Creates A 45" High Mobile Lectern With Storage. When Used Alone, It Is A Mobile Media Stand For Tv/Vcr Or Projector. 3/4" Furniture-Grade Wood Has A Stain-Resistant And Scratch-Resistant Laminate Finish. Lectern Contains A High Percentage Of Recycled Material. 3/4" furniture grade wood construction.